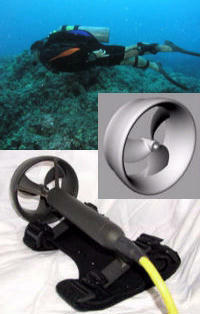 JetBoots are a personal propulsion system for divers from Mazin Submersible Technology, Inc. of Pasadena, California. MST contracted with HydroComp for the development of a new propulsor for their JetBoots version 4 to increase thrust and reduce motor demand. Our tasks were to identify the characteristics and parameters of the highest-efficiency propulsor, and to prepare a 3D CAD model. We delivered a propulsor design based on a contemporary high-efficiency ducted thruster. MST took our CAD models for the duct and propeller, and went directly to manufacture and testing.